Rice brings federal, state, local officials and veterans’ advocates together to discuss efforts to help veterans succeed in the civilian workforce. 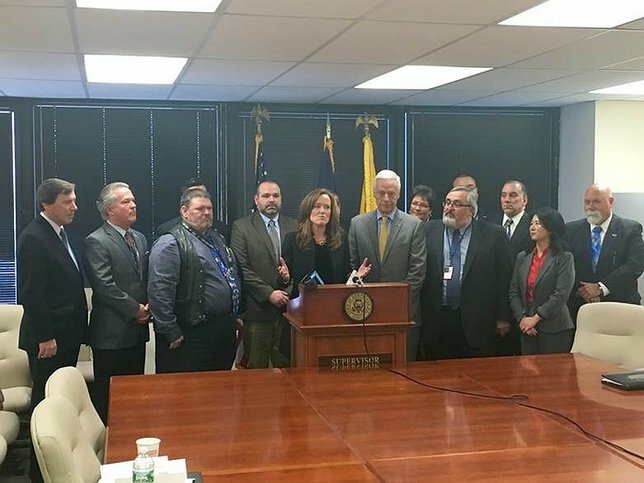 Rep. Kathleen Rice on Monday, February 9th, 2016 at the HempsteadWorks Career Counseling Center advocating for employment opportunities for Long Island's veterans. Hempstead, NY - February 9th, 2016 - U.S. Representative Kathleen Rice, a member of the House Veterans’ Affairs Committee and the Subcommittee on Economic Opportunity, toured the HempsteadWorks Career Counseling Center today with Assistant U.S. Secretary of Labor for Veterans' Employment and Training Michael Michaud, a former Congressman from Maine and the former Ranking Member of the House Veterans’ Affairs Committee, and Town of Hempstead Supervisor Anthony Santino. Following the tour, Rep. Rice, Asst. Secretary Michaud and Supervisor Santino held a roundtable discussion with federal, state and local officials and veterans’ advocates focused on the employment challenges facing veterans on Long Island and ongoing initiatives to help veterans find good, stable jobs in the civilian workforce. Among the participants in the discussion were officials from the U.S. Department of Veterans Affairs (VA), the U.S. Department of Labor (DOL), the Northport VA Medical Center, the New York State Division of Veterans’ Affairs, the New York State Department of Labor, the Nassau County Veterans Service Agency, the Nassau County United Veterans Organization, the Veterans Health Alliance of Long Island, United Veterans Beacon House, United Way of Long Island, Long Island Cares, and the Family Service League. “There should not be a single veteran in this country who wants to work and is able to work but can’t find a job,” said Representative Kathleen Rice. “We have to work together at all levels of government to help find and create opportunities for veterans to put their extraordinary skills, training and experience to use in the civilian workforce, and to continue getting employers to recognize the value of investing in veterans. Subject: LongIsland.com - Your Name sent you Article details of "Rep. Rice, Asst. Labor Secretary Michaud & Supervisor Santino Discuss Veteran Employment Issues at HempsteadWorks"